Chalet w/ Hot Tub, Pool Table, Fireplace! Enjoy The Poconos! Enjoy an affordable, and exciting family or couple’s vacation at the lake! Visit The Poconos and dip into our Hot Tub Haven! This 3-bedroom 2 bath sleeps up to 8 people. 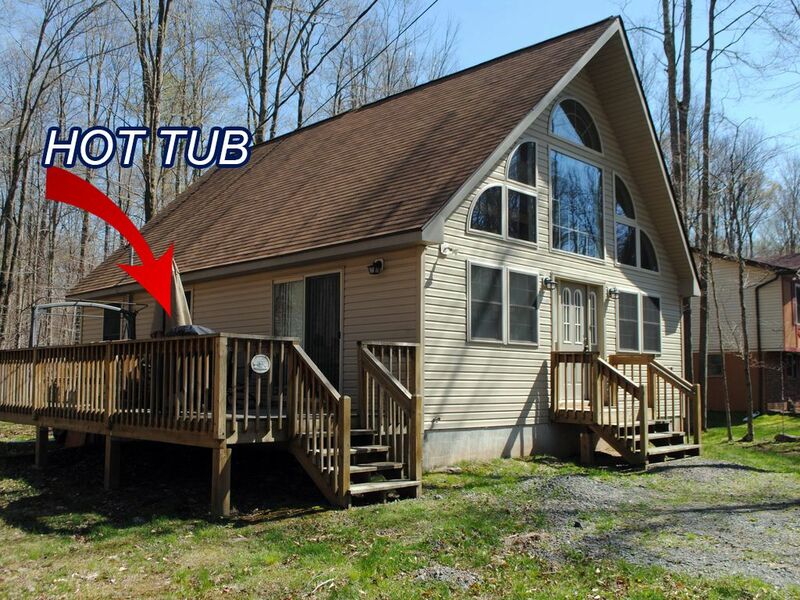 Intimate and cozy, this all-you-need rental has all essentials and includes a relaxing hot tub! A great way to relax after an activity filled day at the lake! With Amenity badges (only required for those over 12), the 3 heated outdoor pools, community center, outside sports, biking, hiking, and exploring the natural area, this home provides all the perks of a rental with an awesome price and relaxing ambiance. Hot Tub Haven is an relaxing hot tub rental in addition to an exciting local experience in The Pocono Mountains! As you dip into Hot Tub Haven you see a comfortable living area connected to the kitchen and dining room area! The kitchen table is great for meals – and for night life, as it converts into a pool table! With a full size kitchen you can prepare ideal meals away from home! The kitchen includes a variety of appliances where you can show off your cooking skills to friends and family! You can prepare a delicious and memorable meal and bake a mouthwatering cake in our oven! Take advantage of our outdoor grill, you can grill juicy steaks or burgers as you look into the clear night sky surrounded by trees and away from city noise! This rental is the perfect size for families looking for a modest vacation, providing just the right amount of accommodations, as you will be spending A LOT of time at the lake, the 3 outdoor heated pools, biking, fishing, and checking out the local Pocono Mountain life and attractions! This home is private, secure, and amazing value for the accommodation! Arrowhead Lake Community is a gold star gated community that is private and secure. Life at the lake provides access to family amenities in addition to natural and peaceful surroundings. Arrowhead Lake has 3 heated outdoor pools, sports, fitness center, fishing, boating, and more! Hot Tub Haven is conveniently located by many of our natural, local, and exciting area attractions only minutes away from this home! Some of our local attractions include golfing, skiing, waterparks, shopping outlets, dams, rivers, and hiking trails! This property is in quiet location perfect for solitude and escaping from the noise of the city. Large family style leather couch. Connects with kitchen and dining room that converts into a pool table! Flat screen, board, games, and cable. Very Spacious, Great For Cooking, Serving, Entertainment and More! The kitchen table quickly turns into night time fun --- it becomes a pool table!! Located between Choctaw and Minisink pools! HOT TUB on the side deck! Excellent view & setting! We went away for an adult getaway. We had a great time. The place was nice and clean. The hot tub was amazing. The hosts were great and most importantly we left the place the way it was when we arrived and got our whole deposit back. No, scamming or nit picking. The only issue we had was the TVs took awhile to figure out, but we eventually did. We definitely want to come back with our kids. Great place!!! Thank you for the amazing great review! We pride ourselves on the quality of our rentals! We disclose all of our rental fees in our rental agreement and emphasize transparency in our transactions! Thank you for emphasizing our process! We strive to be as transparent and up front in our rental process! Our guests love the hot tub and it's certainly a draw to this home! You were a great renter and we look forward to seeing you again! I loved this place. The house was beautiful and although it was just the two of us I would love to come back to this house with some friends in the future since it sleeps up to 10. The place was very clean. I think the property owners were very nice and I had made some calls during my stay to them with small questions and they were so quick to answer and help which I loved. Everything was in the information email. The only reason I can’t give this place 5 stars is because I booked it for the purpose of the pool table and the hot tub. The pool table was great but the hot tub only worked the first night. Really disappointing that it didn’t work at all Saturday or Sunday considering we didn’t plan on going skiing or anything so I booked a home that specifically had some relaxing fun things to do while staying at home. I did contact the property owner and he really tried so hard to be helpful over the phone on what to do and truly went above and beyond. In the end it wasn’t the property owners fault that it wasn’t working it was just bad luck I guess. We tried taking out the filters and restarting it but still nothing. I would still like to stay at this place again because I really liked it but I hope the hot tub works the entire time. I would recommend still and definitely go back. The house SO cute and very clean!!! There are 3 bedrooms and 2 bathrooms. 2 queen beds, one king bed along with 2 futons and a child's bed in the 2nd floor. All appliances in working conditions, including washer and dryer. Lovey fireplace, pool table as dining table was awesome, and the jacuzzi was a bonus!! Check in was a breeze, and the staff in the office were friendly. We would definitely rent this home again, and highly recommend for families. The house and the stay itself was lovely but every other aspect of renting this property was unnecessarily difficult and costly. You have to pay for the credit card processing fee for the security deposit which amounted to me giving them money for the privilege of them holding onto all of the deposit until almost 2 weeks after we left, and I had to ask them to return it (87% was returned). You have to pay for car passes into the gated community, a fee per car and you must register ahead of time or else it costs more. Even with that pre-registration, getting the car pass to get into the community required standing on a long line and was frustrating. The rental agreement was unnecessarily long and linens aren’t provided. Overall I felt like everything was just way more difficult and costly than was necessary and I don’t think I’ll ever rent on VRBO after this. It’s way easier to use other rental platforms. This was so much back and forth and agitation that just wasn’t necessary. Thank you for the review. The money we deduct is the transaction fees that are taken out by homeaway for the transaction on their platform. We do outline this in our rental agreement. We want to ensure the most protection and transparency for our renters and for ourselves in our rental agreements. We deduct this transaction fee (a charge from homeaway) from your security deposit upon return of your security deposit. We are glad you enjoyed our rental and we will work to improve our process with the community. Thank you for your honest feedback so we can improve our process for future renters. This house exceeded our expectations! It was easy to get in touch with the real estate reps and they were very informative and professional. The kitchen was well stocked with everything we needed and we enjoyed a few extras that the house had like extra fans, a DVD player/hulu, and the grill. The pool table and hot tub were awesome! The house felt very homey and the common areas are open which was really great and there was a lot of room for extra sleepers. Thank You! We are glad you enjoyed your stay! We hope to see you again soon! We are always striving to keep up with the latest demand, such as hulu and other types of fun activities for our rental homes! The hot tub is always a perk & a guest favorite and we are glad we were able to provide you with this experience!